Protestors at Sa-Nur said that some of the security forces involved in the evacuation of the site had acted in a violent manner. 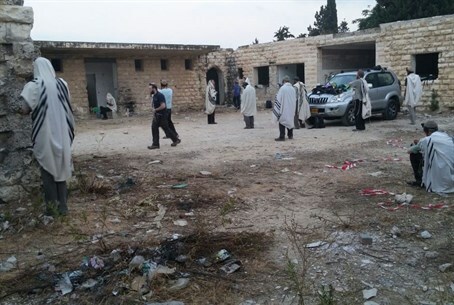 Protestors and residents who attempted to return to their homes in Sa-Nur and were removed by security forces early Thursday said that some of the Border Police and IDF soldiers involved in the evacuation had acted in a brutal and violent manner. Residents said forces used pepper gas and tear gas to quell protests, and that dozens of people, including young children, sustained physical beatings as they were forcibly dragged to buses removing them from the site. Of the 250 people who were at the site, many were evacuated without incident, but several dozen practiced tactics of "passive resistance," refusing to move on their own. It was this group that said that police had acted in a brutal manner. In returning to their abandoned homes, the former residents marked ten years since Sa-Nur was forcibly evacuated, along with three other northern Samaria towns and Gush Katif in Gaza, as part of the 2005 Disengagement plan. The 20 or so families, accompanied by roughly 200 supporters from around the country, were preparing the town for habitation again before the eviction.